Keywords: Flexibility, going with the flow, acceptance. These pretty blue flowers were made into an essence near the Madeleine source on the river Blanque. This wonderful, spiritual elixir is full of the Magdalene’s determination to express her empowering knowledge, whilst also having the flexibility to go with the flow, to avoid martyrdom. Blue Gromwell encourages one to make the best of a situation one cannot change. It disentangles emotional knots, and encourages freedom of the energetic flows that course through our subtle bodies. It helps to free one from rigid thinking and narrow-minded attitudes. It dispels inappropriate mental programming, beliefs and brain-washing from this life and from past lives. It aids meditation by calming the mind, and gently releasing tension and negative emotions. It aligns and balances chakras by releasing, adding to and directing the appropriate energies to each of them. Links to digestion, tension, cramp and muscular contraction. Keywords: Inner sunshine, healing unhappy emotions, insecurity, uneasiness, adjusting to frequency changes, vulnerability. In ancient Palestine there was a golden yellow species of Calendula, specific to the area around the Dead Sea and the hills around Galilee. It was macerated in olive oil, and used to heal wounds and prevent infection. 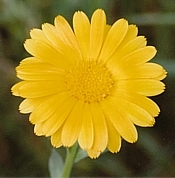 Calendula’s English name is Marigold (Mary’s Gold), but this plant was named after Mary Magdalene, not the Virgin Mary. In the New Testament it is the Magdalene who is known for her use of fragrant oils and healing balms. The Languedoc is the only place in Europe where the Palestinian Calendula species can be found. This essence was made at Rennes Le Chateau, which has a famously ornate church dedicated to Mary Magdalene there. Calendula essence is for those who yearn for the radiance of the sun, or for when one feels unsupported by life. It promotes a sense of security when feeling unsafe or uneasy, without knowing why. This essence electromagnetically strengthens and aligns the boundaries between each of the subtle bodies. So use it when you have had a shock, or have been emotionally knocked off centre. Use it if your energy fields feel unstable or you need grounding. This sun-filled essence lessens irritability, helps one to adjust to new ideas, and to handle the demands of life better. It is good for attracting higher frequencies into one’s being and for alleviating energy depletion during periods of transition or consciousness raising, as well as for counteracting resistance to conscious spiritual growth. Keywords: Purification, releasing emotions, emotional catharsis, shifting karmic patterns. This plant was called the Rose of Sharon in Biblical times. It has striking magenta or white blossoms, and grows wild on the Garrigues (limestone scrubland) of Languedoc. It is the original source of the resin Labdanum, which was used to heal wounds, to promote a meditational state, and as a fumigant to protect one from infection. The essence was made at Rennes Le Chateau. Use Cistus essence to balance the element of water within you. It promotes the purification and release of disharmonious emotions. Use it where emotions have been shut down, especially following trauma. The essence is helpful for those people who are afraid they might lose their minds in the face of trauma or personal loss. It initiates the release of the deepest and most ancient negative karmic patterns, which are sometimes our own, or sometimes inherited on a subtle level from our ancestors. The Cistus flower is uniquely gifted with being able to assist us in the struggle between our human (ego) and divine (spirit) sides (also known as duality by the Cathars). This is especially so where the illusion of human frailty and inherent evilness, leading to our presumed need to suffer to get to Heaven, has been imposed upon us by mainstream religion, in order to give them power and control over "their flock". With intent, Cistus essence can free the mind to find out where true divinity lies. Links to pancreas, sugar digestion. Keywords: Self-respect, dignity, honouring the body, mental strength, determination, tenacity, perseverance, joy of nature, overcoming food cravings. 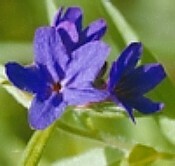 We first encountered this tiny sky-blue flower near Rennes Le Chateau. Thousands of its flowers completely covered the top of the rocky ridge, like a misty blue sea . Each plant has lots of thin, spiky grass-like leaves with the most fragile of six-petalled blooms. On a stalk of only about 3 inches high, this little flower looks a little like a cross between a miniature blue Star of Bethlehem and a Blue-eyed Grass flower, but we were unable to identify it at the time of making the essence. So we called it Fleur de Valdieu, after the place where we found it. However, it has now been identified, and its French name translates into the English Language as "Blue Eyelet" or "Little Blue", but as yet, it has no Latin name. Fleur de Valdieu essence reminds us that we are spirits having a human experience. It instils self-respect for the body that our divine spark resides within, so that we can achieve our life purpose. It promotes joy of nature; of airy places, mountains, seas and plains. It encourages us to recharge our batteries in the open air, instead of staying indoors and watching TV or surfing the internet. This little flower survives the winter snows, icy sub-alpine winds and summer droughts, in a terrain where rock is never far below the surface. Its flower essence instils dignity, determination, mental strength, self-preservation, perseverance and tenacity. It promotes a "mind over matter" state of mind to overcome obsessions and compulsions, particularly food cravings. It can overcome addiction to sugar and additive-laden food and drink, and discourage one from "eating on the run". It makes us more fully consciously aware that if we eat more food than our body can use as energy, and consume more additives than our body can get rid of, the body will store the excess and the unusable substances as fat, to turn one into an unhappy, bulging and unhealthy body. Fleur de Valdieu essence can be used on its own, but for very serious weight issues it is suggested that you use this essence in conjunction with professional advice on diet, supplements and exercise. As well as taking a few of the essence drops by mouth you can also put a drop on the crown chakra and/or rub a few drops on the soles of the feet, and/or rub a drop into the top of the right ear, the top of the right thumb and the top of the right big toe. You can also add a few drops of Fleur de Valdieu essence to a little bottle or a tissue to inhale, together with a few drops of grapefruit and orange essential oils to curb inappropriate food cravings. These are known appetite suppressants. Other suggestions for curbing inappropriate food cravings include peppermint oil or a mix of bergamot and fennel oils. Do not put these oils in your mouth or near your eyes. Keywords: Soul fragment reintegration, clarity, clear-headedness, intuition, focus, completion, wholeness. This majestic indigo orb, made in Lavaldieu (valley of God), speaks to us of wholeness and completion. Lavaldieu lies in the centre of the land pentagram mapped out by Henry Lincoln in his book "The Holy Place". This centre is a sacred site of the Celtic Goddess under the Earth. Each of the narrow, crescent-shaped flowers arc towards each other to create the most beautiful globe. So I have changed its awkward name of "Round-Headed" to "Globe", which more succinctly reflects its Latin name. This powerful flower essence balances the element of ether. When used with intent, it re-integrates soul fragments, lost between lives through torture, grief, loss or other trauma. It helps to consolidate and unify the astral body. Generally it promotes clearer intuition, mental balance and focus, and assists in following through one’s goals with clear-headed vision. It offers the gift of calm perseverance through difficult times, and helps one to see the light at the end of the tunnel. It instigates a sense of wholeness and completion, and guides one in knowing when to fight for change, and when to accept a situation. Keywords: Freedom, escaping constriction, tightness, persistence, perseverance, restriction. Although Pink Bindweed, (commonly known as Field Bindweed), is often seen as a noxious weed by gardeners, there is a delightful local myth about the flower being called "Our Lady of the Little Glass". It says that Our Lady stopped and helped to release a wagon stuck in a rut, and then used this plant’s little pink and white flower head to accept a drink of wine from the grateful wagon owner. This "Our Lady" fits the description of Mary Magdalene, who was young and fit when she arrived in France, and spent much of her life there on the road. This elixir was made at Rennes le Chateau, one of the points of Henry Lincoln’s pentagram on the land. Generally, patterns on this flower are variable from place to place, but in Rennes the Bindweed flowers all bear striking pentagram-shaped white markings! When your life is in a mess, from which there seems to be no way out, this essence helps you to untangle yourself from difficult situations or relationships with spouses, family members, friends or co-workers. Bindweed clears energetic blocks, fear-based ties and toxins from the subtle bodies. Bindweed is linked to the element of fire, and it fosters a love of freedom. It prevents abusive types from being attracted to one, by removing the ingrained expectation of becoming one of life’s victims, due to having suffered emotional, mental or physical abuse as a child, or in past lives. Links to digestive chemicals, nervous system, stress hormones, bones. Keywords: Raising spiritual frequencies, fulfilling life’s purpose, self-awakening, far memory, uniqueness. The Romans promoted the growth of Roses from Persia throughout Europe, and are said to have had a tradition of using Rosa gallica to alleviate 32 different health problems. This beautiful, rosy red flower was made into an essence at the centre of one of the many "village circulades" that can be found in the Languedoc. The inwardly spiralling shape of the buildings enhances the naturally occurring earth energy vortex, used to raise the spiritual frequencies of mankind. 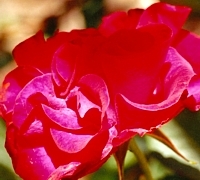 This Rose essence guides higher energies into human consciousness to open the heart chakra, re-connect heart and mind, and to promote spiritual rejuvenation, far memory and progressive levels of self-awakening. It keeps us centred, and it helps to support the mind and body through transitional frequency changes, transitional life events and rites of passage. Rose fosters the ability to comfortably accept being different, radical or unique in how we live or express ourselves. It promotes the instigation and unfolding of our unique qualities, skills and understanding, so that we can develop our talents to their full potential, and fulfil our soul purpose in this lifetime. Most importantly it encourages transition into the light, by helping us to be aware of, look for and go into the light at the moment of death, rather than being held earth-bound in the astral planes. Keywords: Detoxifying, overcoming grief, loss and inappropriate cultural programming, resistance to negative influences. This pretty, soft pink flowering orb of Rosy Garlic, was made into an essence near to a site sacred to Mary Magdalene at Rennes Les Bains. It is linked to the element of water and is a purifier on many levels. The essence promotes the release of heavy emotional toxins from those suffering from grief of loss. It calms anger and fear, and helps one to cast off grudges, judgement, resentment and old hidden grief. The essence is particularly important for helping one disengage from harmful or inappropriate cultural programming, for example various moral, political or religious beliefs. Mary was frowned upon for flaunting her opposition to the cultural programming of her time, when she burst into a men-only mealtime, uncovered her hair in public, and then anointed a man in public, which then only the Rabbis were allowed to do. This essence promotes a sense of wholeness, and can be used to build resistance to negative influences through creating stronger subtle boundaries and a more unified, resilient sense of self. Keywords: Optimism, hope, tenacity, strength, survival, perseverance, thriving, meeting challenges. In May the hills and mountains, Maquis (heathland) and Garrigues are completely covered in the bright yellow flowers of this hardy and tenacious shrub, that embodies the consciousness of the Languedoc region. Thriving on thin, poor soil, the abundant vanilla-fragranced blooms of this plant bring the promise of warm, sunny days to come. 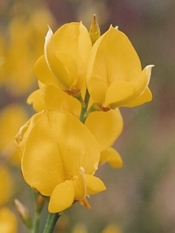 Spanish Broom essence, rich in the Goddess in the land energies, was made in Lavaldieu. This area is in the centre of the Rennes Le Chateau pentagram, first mapped out by Henry Lincoln. The essence promotes spiritual evolution and speaks to our soul of optimism and hope. When you have hope you can more easily overcome many of life’s challenges, viewing them as opportunities for self-growth and for helping others. Its primary role is to banish misery and pessimism, but it can be used as the initial "port-of-call" essence for any problem or worry. It promotes calmness and dissipates emotionally charged situations, agitation and deep-seated unconscious fears. It releases co-dependence in relationships, banishes the need to play the rescuer role, and helps one to start afresh. It promotes optimistic feelings about the world, and overcomes the tendency to believe in the mass media portrayal of world events, that often bring pessimism and depression to many people’s hearts. Keywords: Neutralising malicious thought patterns, restoring one's good name, restoring self-esteem, self-worth and self-confidence, overcoming character assassination and judgementalism, promoting open-mindedness, awareness of sacred spark within. This beautiful White Peony essence was made in the Languedoc near Carcassonne, at a sacred portal not far from the site of an ancient oratory, where there is a ancient black Madonna. A channelled message came from Mary Magdalene through a friend, to make a white Peony flower essence to add to the Magdalene flowers range. This essence is for neutralising unjust, malicious fabrications, harmful gossip and character denigration, due to jealousy, manipulation, control, competition or fear. Peony awakens our inner perception, via the Pineal gland, to make one aware of the sacredness of one’s spirit within our physical selves. By filling one with light, through increasing higher frequency flows through the pineal, crown and solar plexus chakras, this essence instils one with much greater self-belief, self-esteem and self-confidence. It promotes open-mindedness and overcomes judgemental attitudes. White Peony neutralises the barbs of malicious thought, that are so harmful to the ultimate emotional and physical well-being of sensitive people. Where a thought form has been created by stimulating a number of people to pour hateful, vengeful and destructive thoughts upon another, such as through the use of the media, religion or government, anyone choosing to support that maligned individual, whether they are still living or not, and even hundreds of years later, may also find themselves subjected to the same kind of character assassination and denigration that the original maligned individual was subjected to. This is because the thought form has been kept alive in the minds of the originator’s heirs and those they influence, and it then acts as an negative wish trigger whenever the maligned individual’s name is mentioned. Peony essence instils courage, clarity, inspiration and an inner knowing of the truth within those open-minded individuals who seek to clear someone’s name, reputation or business from unjust judgement. Peony essence helps them to succeed in their endeavour, and when they do, the thought form is deprived of further sustenance, and can no longer adversely affect people’s belief patterns. This is a combination of Blue Gromwell, Calendula, Cistus, Globe Rampion, Pink Bindweed, Rose, Rosy Garlic, Spanish Broom and White Peony flower essences. Many people associate Mary Magdalene with Venus, the Goddess of Love, and believe that her re-emergence in popularity to-day is simply for promoting love and light. But it is difficult to love oneself and others if you are being victimised or persecuted for who and what you are. If one’s soul purpose is to be a pioneer, to promote spiritual expansion, to overcome bigotry, or to change humanity for the better, but it is continually thwarted lifetime after lifetime, the spirit keeps returning to try to finish its uncompleted life purpose. This is particularly the case where soul fragments lost through trauma, need to be re-integrated, to return the soul to completeness. These people often subconsciously carry with them the fear and expectation of being persecuted for being heretical or different, but this doesn’t stop them from being heretical or different, as they have opted to complete that soul purpose. So this essence is primarily for removing the expectation of being persecuted for being different or heretical. It heals souls scars, and sweeps away past memories, negative karmic patterning inherited from ancestors, brain-washing, negative belief programming and emotional blockages, that keep us locked into victim mode, lifetime after lifetime. The essence promotes spiritual expansion and fosters a love of freedom. It instils the courage to stand up for oneself, as well as a comfortable acceptance of just being our natural selves. It removes fear-based ties and restrictions within the subtle bodies. It releases co-dependence, and with intent, it also reintegrates soul fragments. This is a combination of Freedom flower essence(Blue Gromwell, Calendula, Cistus, Globe Rampion, Pink Bindweed, Rose, Rosy Garlic, Spanish Broom and White Peony) in spring water and vodka, with Cistus, Benzoin & Frankincense oils, and Anise, Atlas Cedar, Cinnamon, Cypress, Lime, Myrrh & Sandalwood oils. Keywords: Channelling, Linking heart and mind, raising spiritual frequencies, far memory, shifting emotional bocks, deprogramming behavioural misinformation, calming nerves, courage, overcoming fear, reintegrating soul fragments. Please note that this beautiful and warm herbal-fragranced Magdalene Gift spray is for inhaling through the hands, and for anointing various parts of the body, such as the crown chakra, base of the spine and soles of the feet. Designed for healing the mind and balancing the emotions, it is rich in essential oils at a higher concentration than the oil mixes used for massage. Therefore avoid spraying The Magdalene Gift Spray around the face, and avoid all contact with the eyes, mouth or sensitive parts of the body. Do not use on babies or young children, or if you are suffering from skin rashes. The Magdalene Gift spray is rich in precious Biblical oils, which together with the Freedom essence combination, build a bridge between the heart and mind, to open the door to higher frequencies. We have found through aura photography (see photo in the "About the Gaia Magdalene Flower Essences at the top of this page) that Mary's energy promotes the fuller opening of the pineal gland, to enhance clearer channelling abilities and access to past lives and The Akashic records. I use it for all my channelling sessions and trance work, and on clients before their past life sessions with me. It promotes spiritual growth, far memory, unfettered intuition and unbiased logic. The Magdalene Gift's unique combination of essences and Biblical essential oils releases misinformation and belief patterns that have become in embedded in the behavioural DNA, due to negative personal or ancestal life experiences.This combination removes fear-based programming that has disempowered one with emotional paralysis or apathy. It overcomes victim consciousness, which has built up over lifetimes of persecution. With intention, it also promotes the reintegration of lost soul fragments. The Magdalene’s Gift has a releasing and detoxifying effect on the emotional body, with Benzoin dissolving emotional blockages and Frankincense removing fear-based programming constrictions in the subtle bodies. Cistus (Rose of Sharon) reprogrammes behavioural DNA, promotes cellular regeneration and calms nerves. Cinnamon restores self-confidence and instils the courage to create the changes one needs in life. Atlas Cedar and Sandalwood oxygenate the cells, promoting mental clarity and de-programming cellular misinformation. Cypress promotes feelings of security, and overcomes fear of threats to survival. Myrrh has a positive effect on the amygdala, promoting a feeling of well-being, as well as reprogramming the cellular memory, to keep one balanced in mind and body. Directions for Use: Put a little of this powerful spray on your hands. Rub your hands together and inhale deeply through your hands. Then pass your hands over your aura three times. Repeat twice daily for 28 days. This spray can also be used for anointing non-sensitive parts of the body, such as the soles of the feet, but because it contains a stronger amount of essential oils than is used for massage, avoid using it on body parts that are likely to be sensitive or easily irritated. If any irritation occurs apply any vegetable oil to dilute the spray first, and then wash off with soap and water. Keywords: - Empowerment, core confidence, aura cleanse and shine, self-respect, enthusiasm, self worth, self-love, faith, optimism, security, aura protection, overcoming trauma, fears, self criticism & self depreciation, dissolving belief patterns, connection to light, re-integrating soul fragments, re-connecting heart & mind. This Aura Shine flower and gem combination essence contains Rose, Globe Rampion, Cistus & Spanish Broom flower essences, & Erythrite, Eudialyte, Golden Topaz, Sunstone, Labradorite, Rutilated Quartz, Tourmalinated Quartz & Zincite gem essences. I feel there is an all-pervading, underlying belief pattern that causes modern humans to presume that big is better. This applies very much to men versus women. In general women are smaller than men. Because they are commonly viewed as "smaller versions of men", women are viewed as therefore less strong, less fast, less valuable, and with having smaller heads than men, also less intelligent than them. This is not the case at all, but shorter women, and shorter men to some degree, are subconsciously perceived by many to be less able. So smaller adults lose out in respect, faith and esteem from others before they even open their mouths, even in areas for which great strength is not required. For example would the average Western man pick Arnold Schwarzenegger to be mayor of California, or would he choose an equally qualified, but tiny female actress, who was only 4’10" in height? In many parts of the world women are disempowered to a large degree by this belief in "the size matters" pattern, banned from further education and a career, and treated as second rate citizens to men in all respects. So I studied people who are very successful in their field, but are shorter than the average man. Firstly I noticed that many make up for their lack of height by wearing very high heels, big hairstyles or expanding in girth instead! But what about those very successful people who remain slim and short. What have they got that brings them respect, esteem and recognition of their abilities? Firstly they all have an absolute passion for what they do. Secondly they have charisma and great self-confidence. Thirdly, through dowsing, I found that they all had a large, healthy and shining auras. It didn’t matter what physical size they were, the size of their auras was the same size or larger than other physically much larger people than themselves, and was not dependant at all on their gender. And on a subconscious level we are all aware of how people feel about themselves through reading their auras.Then I set about making an combination essence and aura spray that would instil deep core confidence and enthusiasm for life, and re-instate a large and shining aura - one that could not be sabotaged, drained or deflated by one’s own or others belief patterns.Aura Shine essence is specifically designed to clear, brighten and expand the aura to an optimum and healthy size. A few drops can be taken by mouth under the tongue, added to water to drink, or rubbed into chakras, the back of the head or the soles of the feet. It contains a combination of four Magdalene flower essences and eight powerful gem essences. Erythrite has striking, deep magenta pink crystals. The essence made from it strengthens one’s core energy at every level. It instils confidence and personal empowerment, which arises from an unshakable assurance of inner strength (from Judy Hall’s Crystal Bible 2). Spanish Broom essence brings hope and banishes pessimism. Globe Rampion essence helps to consolidate and unify all parts of the astral body, and also re-integrates soul fragments lost through trauma. Rutilated Quartz cleanses and infuses the aura with light energy. Zincite and Golden Topaz re-energise depleted energy systems. These essences instil courage and confidence, remove energy blocks and take out negative energy. They also provide protection against psychic attack. They instil passion for life and remove fears, phobias and constrictions, caused by current and past life trauma. Zincite releases painful memories and shock, which can lead to a aura shrinkage. It also overcomes feelings of disempowerment and an inability to make the necessary changes needed in one’s life. Golden Topaz clears and activates the sacral and solar plexus chakras. It helps one manifest desires, alleviates nervous exhaustion and aids in the recognition of one’s own abilities. Eudialyte, a pretty pink crystal, works on the base and heart chakras. Eudialyte and Rose essences align the chakra energy flows, to open the heart chakra for re-connection of spirit and mind with the emotional body. Eudialyte dispels dissatisfaction, jealousy, guilt, resentment, scarcity-mindedness, confusion, self-criticism, self-doubt, and self-depreciation. It encourages one to honour and respect oneself. It promotes self-forgiveness, and helps one to learn from mistakes. Labradorite sweeps away fears and insecurities, and strengthens faith in oneself and trust in the Universe. It creates a force field around the aura to prevent energy leaks, and protects and strengthens the energies within. It also has the unique ability to remove other people’s projections of oneself. Sunstone dissolves feelings of unworthiness and instils joie de vivre by instigating a profound connection to light. It encourages optimism, removes inhibitions and reverses feelings of failure. Cistus essence dispels inharmonious emotions and past trauma. Tourmalinated Quartz acts like a psychic vacuum cleaner, removing negative energy patterns, and purifying and repairing the auric field. It alleviates self-sabotage, and creates a bubble of light around the body to screen out destructive energies.Aura Shine essence links to first, second, third and fourth chakras, skin, hair, prostate glands, mid-life hormonal changes and posture. Keywords: - Empowerment, core confidence, aura cleanse and shine, self-respect, enthusiasm, self-worth, self-love, faith, optimism, security, aura protection, overcoming trauma, fears, self criticism & self depreciation, dissolving belief patterns, connection to light, re-integrating soul fragments, re-connecting heart & mind. This Aura Glow flower and gem combination essence spray contains Grapefruit, Rose, Lime, Frankincense, Myrrh, Cedarwood, Cypress & Rosemary essential oils, together with Rose, Globe Rampion, Cistus & Spanish Broom flower essences, & Erythrite, Eudialyte, Golden Topaz, Sunstone, Labradorite, Rutilated Quartz, Tourmalinated Quartz & Zincite gem essences. I feel there is an all-pervading, underlying belief pattern that causes modern humans to presume that big is better. This applies very much to men versus women. In general women are smaller than men. Because they are commonly viewed as "smaller versions of men", women are viewed as therefore less strong, less fast, less valuable, and with having smaller heads than men, also less intelligent than them. This is not the case at all, but shorter women, and shorter men to some degree, are subconsciously perceived by many to be less able. So smaller adults lose out in respect, faith and esteem from others before they even open their mouths, even in areas for which great strength is not required. For example would the average Western man pick Arnold Schwarzenegger to be mayor of California, or would he choose an equally qualified, but tiny, female actress who was only 4’10" in height? In many parts of the world women are disempowered to a large degree by this belief in "the size matters" pattern, banned from further education and a career, and treated as second rate citizens to men in all respects. So I studied men and women who are very successful in their field, but are shorter than the average man. Firstly I noticed that many make up for their lack of height by wearing very high heels, big hairstyles or expanding in girth instead! But what about those very successful people who remain slim and short. What have they got that brings them respect, esteem and recognition of their abilities? Firstly they all have an absolute passion for what they do. Secondly they have charisma and great self-confidence. Thirdly, through dowsing, I found that they all had a large, healthy and shining auras. It didn’t matter what physical size they were, the size of their auras was the same size or larger than other physically much larger people than themselves, and was not dependant at all on their gender. On a subconscious level we are all aware of how people feel about themselves through reading their auras.Then I set about making a combination essence and aura spray that would instil deep core confidence and enthusiasm for life, and would re-instate a large and shining, healthy aura - one that could not be sabotaged, drained or deflated by one’s own or others belief patterns.Aura Shine Spray is specifically designed to clear, brighten and expand the aura to an optimum and healthy size. Please note that this Aura Glow spray is for putting on the skin or through the aura, and should not be taken by mouth. If you cannot, or prefer not to take the Aura Shine essence by mouth, then a little of this spray can be put on the hands and then swept through the aura. It can also be sprayed on the back of the head, or on the crown chakra, or rubbed into the soles of the feet. It contains a combination of four Magdalene flower essences and eight powerful gem essences, together with essential oils of Grapefruit, Frankincense, Rose, Cedrus Atlantica, Cypress, Lime, Myrrh and Rosemary. Together they create a gentle and uplifting citrus aroma, that enhances the confidence-boosting, empowering, self-accepting, purifying, protective and strengthening attributes of the flower and gem essences, contained in Aura Glow. *Normally you will only be spraying a small amount of this spray on yourself, but if you are pregnant, I have to recommend that you seek professional therapist advice before using it. Avoid spraying it near eyes, the mouth or other sensitive areas. Do not spray on varnished wooden or plastic surfaces or electrical equipment.Erythrite has striking, deep magenta pink crystals. The essence made from it strengthens one’s core energy at every level. It instils confidence and personal empowerment, which arises from an unshakable assurance of inner strength (from Judy Hall’s Crystal Bible 2). Spanish Broom essence brings hope and banishes pessimism. 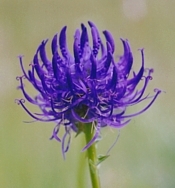 Globe Rampion essence helps to consolidate and unify all parts of the astral body, and also re-integrates soul fragments lost through trauma. Rutilated Quartz cleanses and infuses the aura with light energy. Zincite and Golden Topaz re-energise depleted energy systems. These essences instil courage and confidence, remove energy blocks and take out negative energy. They also provide protection against psychic attack. They instil passion for life and remove fears, phobias and constrictions, caused by current and past life trauma. Zincite releases painful memories and shock, which can lead to a aura shrinkage. It also overcomes feelings of disempowerment and an inability to make the necessary changes needed in one’s life. Golden Topaz clears and activates the sacral and solar plexus chakras. It helps one manifest desires, alleviates nervous exhaustion and aids in the recognition of one’s own abilities. Eudialyte, a pretty pink crystal, works on the base and heart chakras. Eudialyte and Rose essences align the chakra energy flows, to open the heart chakra for re-connection of spirit and mind with the emotional body. Eudialyte dispels dissatisfaction, jealousy, guilt, resentment, scarcity-mindedness, confusion, self-criticism, self-doubt, and self-depreciation. It encourages one to honour and respect oneself. It promotes self-forgiveness, and helps one to learn from mistakes. Labradorite sweeps away fears and insecurities, and strengthens faith in oneself and trust in the Universe. It creates a force field around the aura to prevent energy leaks, and protects and strengthens the energies within. It also has the unique ability to remove other people’s projections of oneself. Sunstone dissolves feelings of unworthiness and instils joie de vivre, by instigating a profound connection to light. It encourages optimism, removes inhibitions and reverses feelings of failure. 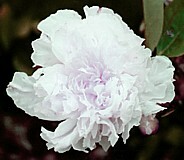 Cistus essence dispels inharmonious emotions and past trauma. Tourmalinated quartz acts like a psychic vacuum cleaner, removing negative energy patterns, and purifying and repairing the auric field. It alleviates self-sabotage, and creates a bubble of light around the body to screen out destructive energies.Aura Glow Spray links to first, second, third and fourth chakras, skin, hair, prostate glands, mid-life hormonal changes and posture.